VANCOUVER -- A prominent member of Prime Minister Justin Trudeau's cabinet is reaching out to Syrian refugees after a group of newly arrived migrants were pepper sprayed at a welcome event in Vancouver. 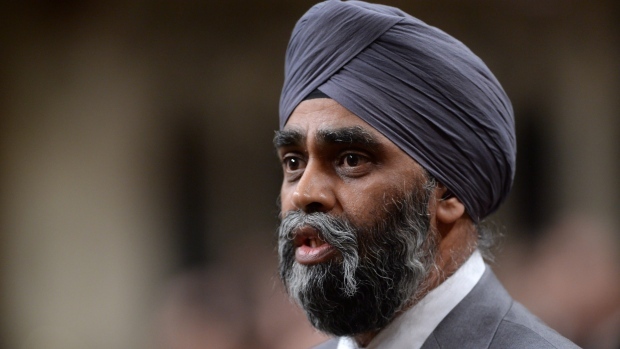 Defence Minister Harjit Sajjan described Friday night's attack as an "isolated incident" and said the Syrian refugees he met with the following day were resilient and happy to be in Canada. "In the last 24 hours I was able to visit a mosque, a church and a Sikh gurdwara, all communities who are supporting and welcoming refugees. That's the real Canadian way," he said on Sunday. A crowd was gathered outside a Muslim Association of Canada centre during an event for government-sponsored Syrian refugees on Friday around 10:30 p.m. when a man on a bicycle rode by and pepper sprayed about 15 people, said Vancouver police spokesman St. Randy Fincham. Sajjan spoke with some of the Syrian refugees present for the attack during a welcome gathering in his Vancouver-area riding Saturday evening that was planned before Friday's pepper spray incident. "They're so happy to be able to be here in Canada," he said, describing the event's atmosphere as celebratory. "Because of the positive reaction that they're getting from everywhere they go, a horrible but isolated incident like this can be quickly forgotten and they can get on with their life." Tima Kurdi, a prominent member of Canada's Syrian community, dismissed the attack as a one-off event that doesn't reflect how the majority of Canadians view the newly arrived migrants. She said the support Canadians have shown to refugees is "unbelievable" and they shouldn't be blamed for Friday night's incident. "To be honest, Canadian people would not do this, the majority of them," she said. "They are big supporters to the refugees." Kurdi became an overnight spokeswoman for the plight of Syrian refugees after a photo of her three-year-old nephew lying dead on a Turkish beach drew global outrage and attention to the migrant crisis in the Middle East. Canada's Immigration Minister John McCallum described Friday's pepper spraying as an "isolated incident" that won't tarnish the country's migrant-friendly reputation. The world recognizes that Canada is very welcoming to refugees, and that message will continue to resonate, said McCallum. Canada has been praised on the world stage for its pledge to take in 25,000 Syrian refugees by the end of next month, and a photo of Prime Minister Justin Trudeau welcoming migrants at the airport was published around the world. McCallum said his government utterly condemns the pepper spraying and says Syrian refugees have no reason to feel unsafe in Canada. "I think that the experience that the vast majority of them have, of being welcomed at the airport, and given what they need, clothing and hats and boots, and large numbers of welcoming Canadians ... I think that sent a very clear message," he said in an interview Saturday. "I think that experience shared by so many of the refugees is going to easily trump this one isolated incident." British Columbia's jobs minister Shirley Bond said Saturday that she was dismayed that the province will be talked about across the country because of a "shameful act." She said the incident is entirely contrary to what she's seen across B.C., where people have opened their homes and offered generosity to Syrian refugees. "British Columbia is known as a place that is inclusive, that is incredibly multicultural," she said. "I was heartsick, because this is not who we are. It does not reflect our values. I think British Columbians need to stand up and condemn what happened, and I think that will be the strongest message we can send."